I celebrate St. Patrick’s Day in two ways: I wear green, especially my black scarf with bright green shamrocks, and I eat even more greens this special day. This year I have a the added benefit of having just finished Nava Atlas’ wonderful vegan cookbook, published in 2012 and entitled Wild About Greens, with 125 recipes on leafy greens. Many years ago I met Helen Nearing and Scott Nearing, a back-to-the-land couple who moved to Maine and started a generation of back-to-landers. 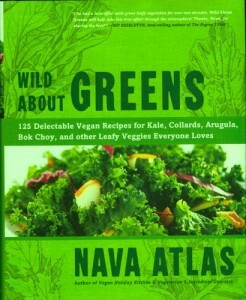 In one of her books she wrote that greens were the staff of life, not grains. While my meatless diet has long been centered on grains and beans, I am slowly accepting Nearing’s words, and Wild About Greens will be a big help. The Introduction is actually like a chapter itself. On page 11 is a list of the health benefits of leafy greens that includes the facts that leafy greens are a rich source of vitamins and minerals, such as folic acid (a B vitamin), vitamin C and vitamin K (essential to good bone health), calcium (significant source), potassium, magnesium, iron, carotenoids (antioxidant properties), and omega-3 fatty acids (modest but reliable source.) Equally important, I think, is that these greens are a high in fiber and low in calories and carbohydrates, and also a great source of chlorophyll, which is purported to support our internal system and counter the effects of aging. So greens are really good for you! Also, the Introduction contains buying and preparation tips followed by a 17-page introduction to leafy greens themselves, printed on soft green paper to make this section easy to find later. The actual first chapter, “Basic Preparations for Leafy Greens”, is must reading, since there are several ways to make them tasty, from simple steaming to braising to drying. Since my motto is The Good Taste of Health, having greens taste good is just as important as having them be good for you. And with so many wonderful recipes to choose from, you will find many to try and enjoy, starting with Chapter 1, which includes several recipes using the above-mentioned basic preparations of sautéing, braising, stir-fryng and preparing sauces for the greens. Chapter 2 is entitled Greens with Beans, Grains, Pasta & Other Vegetables; Chapter 3 is Salads, Dressings & Dips; Chapter 4 is entitled Greens in Soups & Stews, and Chapter 5 is Green Juices & Smoothies, based on Victoria Botenko’s* ideas of using a blender instead of a complicated juicer to get a green boost from a smoothie of greens and soft fruits. This is a green primer with information that is important to our health. I already have a list of 25 to try. Here’s one that just happens to be for St. Patrick’s Day. What a coincidence to find this in Atlas’ book right before the 17th. 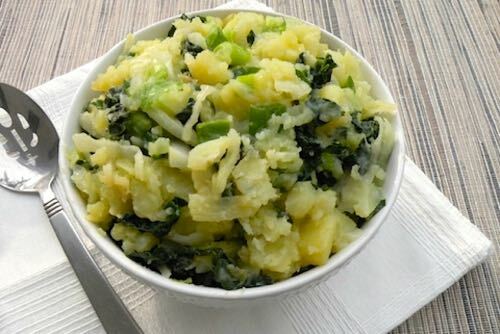 Author’s Notes: In this Irish classic, potatoes and cabbage − or kale – are lightly browned in a skillet. Here I’ve used both types of greens, and with a generous portion of leeks, it’s tastier than ever. Cook, bake or microwave the potatoes in their skins until they are easily pierced. When the potatoes are cool enough to handle, peel and cut them into large chunks and place them in a bowl, Mash them coarsely and stir in the rice milk. Heat half the oil in a large skillet. Add the leeks and sauté them over medium heat, covered, for 2 or 3 minutes, or until they are wilted. Add the cabbage and continue to sauté covered, adding a small amount of water to keep the bottom of the skillet moist, for 2 minutes longer. Add the kale and the remaining oil and sauté, uncovered, until the cabbage begins to turn golden. If the skillet becomes dry, add small amounts of water as needed. Turn the heat up to medium-high and stir in the potatoes and parsley. Sauté without stirring until the bottom of the mixture gets nicely browned. Stir and allow more of the mixture to brown. Season with salt and pepper, and serve. * I have reviewed Victoria Botenko’s books, but the one most relevant for today is: https://www.menupause.info/archives/2962. Happy St. Patrick’s Day, the wearing’ and eating’ of the green! Wild About Greens, beautifully illustrated by Susan Voison (blog.fatfreevegan.com) and published by Sterling publishers of New York. The cost is $24.95 and available online & in stores. This entry was posted on Monday, March 16th, 2015 at 9:00 pm	and is filed under Reviews. You can follow any responses to this entry through the RSS 2.0 feed. You can skip to the end and leave a response. Pinging is currently not allowed. this is one of my favorite veggie cookbooks!!!!! everyone should have a copy!